Why is the Republican symbol an elephant? Why is the Democratic symbol a donkey? It is not because humans are, by nature, political animals, although some such as Aristotle have argued that this is the case. 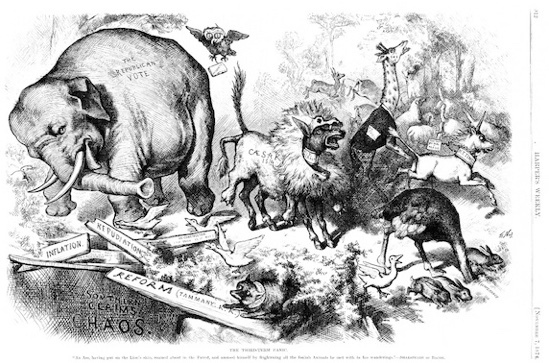 The association of these two animals with the dominant political parties in the United States can actually be attributed largely to the work of the German cartoonist Thomas Nast, whose drawings helped illiterate voters in the 19th century better understand politics. At the age of six, Nast moved from Germany to New York City where he studied art. After finding work for both Frank Leslie's Illustrated Newspaper and the New York Illustrated News, he took a job with Harper's Weekly in 1862. His cartoons had the power to change public opinion. 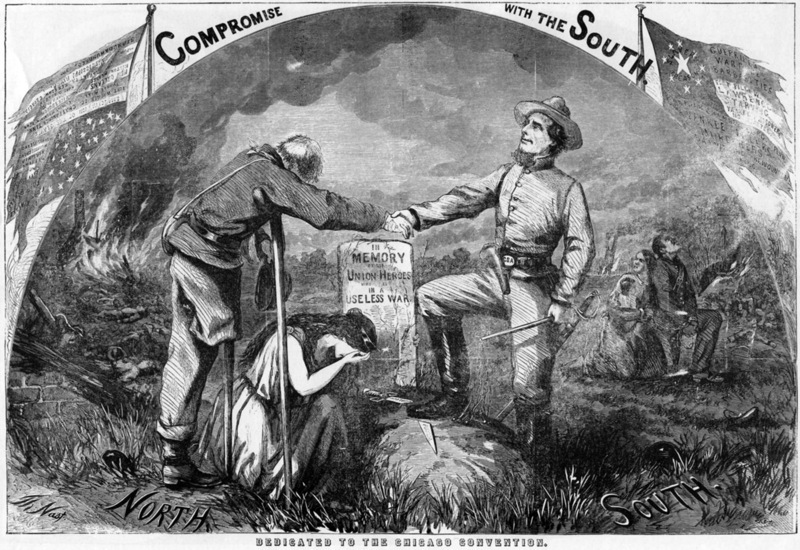 His illustration, "Compromise with the South," was considered by President Lincoln a contributing factor to his re-election as president in 1864. The two cartoons that were responsible for perpetuating the images of the Democratic Donkey and Republican Elephant appeared in Harper's Weekly in the 1870s. In a cartoon published on January 15, 1870, Nast depicted a donkey kicking a dead lion that is identified as Lincoln's late secretary of war, Edwin Stanton. The donkey was associated with "Copperheads," a group of Northern Democrats who opposed the Civil War. The use of the donkey imagery reflected Nast's hostility to the Copperheads. Donkeys had been popularly associated with the Democratic Party since Andrew Jackson, who had been referred to as a jackass by his opponents during the 1828 campaign. Nast's continued association of the donkey with Democratic organizations represented a revival of this symbol. In 1874 Nast published a cartoon that was meant to dispel concerns that Republican President Ulysses S. Grant, who was then in his second term, might run for a third and become a dictator. The Democratic Party press had been playing on voters’ fears. In this cartoon, Nast depicts an elephant fleeing in fear from a donkey that is wearing a lion's skin. 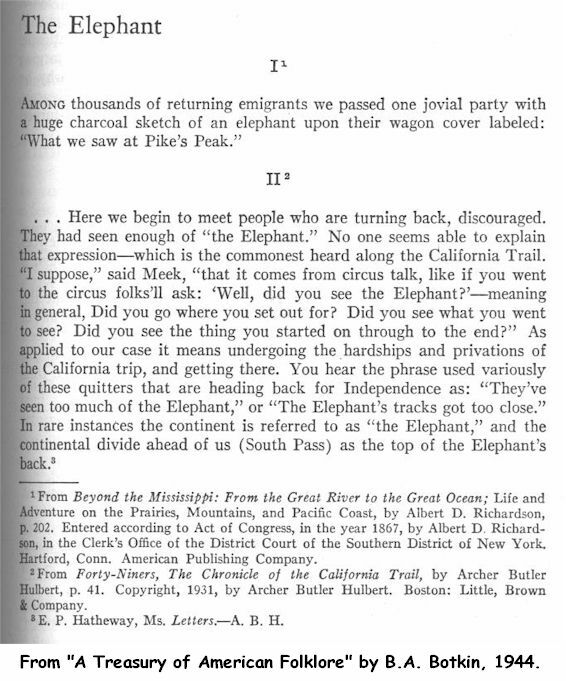 The elephant had been associated with the Republican Party since it was shown celebrating Union victories in an advertisement that appeared in an 1864 issue of the newspaper Father Abraham. In creating this cartoon, it is possible that Nast took inspiration from the phrase "seeing the elephant." This phrase was commonly used by men traveling West during the Gold Rush of 1849, and it can refer both to participation in combat and the completion of difficult goals, especially those that are achieved in foreign places. It is also possible that a powerful but potentially dangerous animal simply seemed to Nast to be the best choice. Unfortunately for Nast, his effort to influence readers with his cartoons proved less successful during the 1874 campaign, when the Republicans lost the majority in the House of Representatives. 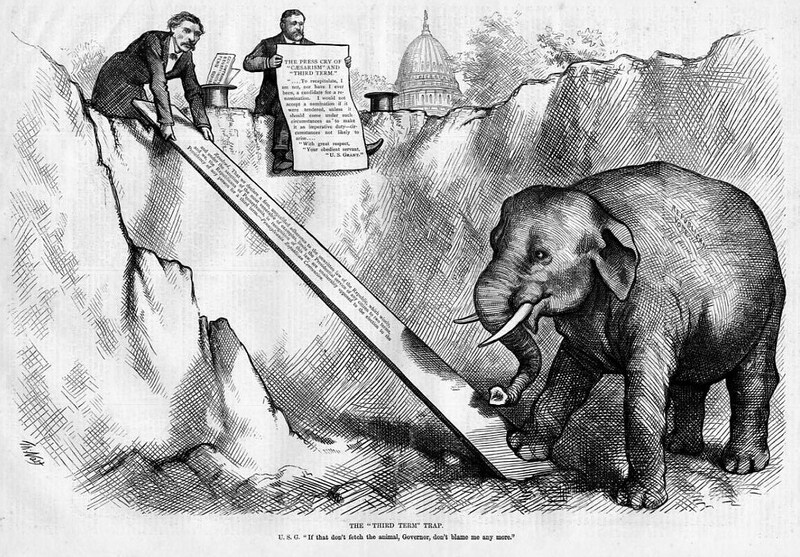 Nast responded by publishing a cartoon in which an elephant is caught in a trap that was set by a donkey, the Capitol Building looming in the background. Only the Republican Party has officially endorsed the symbol used by Nast. While Democrats might not want to embrace an association with a stereotypically stubborn animal such as a donkey, neither animal is a particularly flattering model. However, Andrew Jackson was able to associate the donkey with positive qualities such as loyalty and perseverance, and it seems that politicians today try to identify with the most positive qualities of their party's "mascot." Blitz, Matt. "How a Donkey and an Elephant Came to Represent Democrats and Republicans." Today I Found Out. April 4, 2014. Accessed March 10, 2016. Botkin, B.A. "The Elephant." In A Treasury of American Folklore. New York: Crown Publishers, 1944. Accessed March 10, 2016. Jonah World. Conti, Gerald. "Seeing the Elephant." 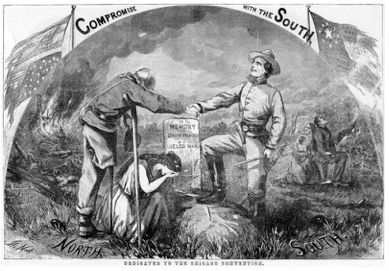 Civil War Times Illustrated. June 1984. Accessed March 10, 2016. Jonah World. Miller, Fred. "Political Naturalism." Stanford Encyclopedia of Philosophy. Last modified 2011. Accessed March 10, 2016. Stamp, Jimmy. 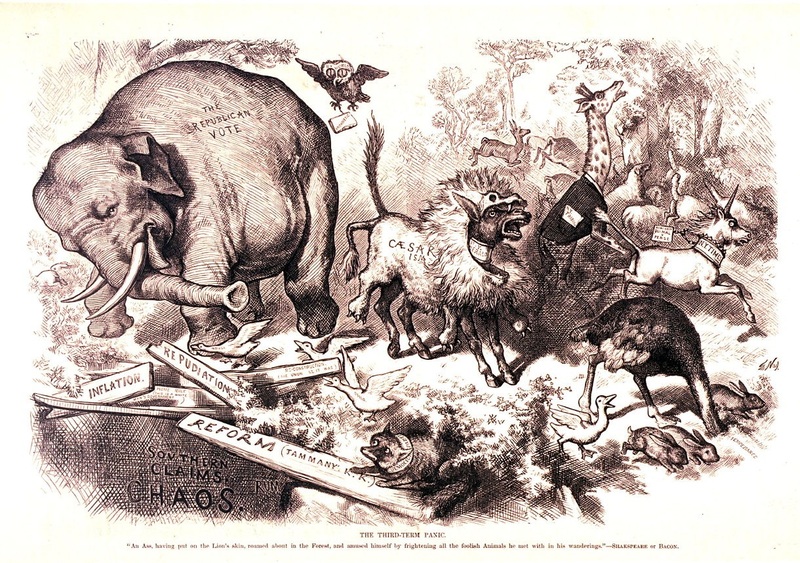 "Political Animals: Republican Elephants and Democratic Donkeys." Smithsonian,October 23, 2012. Accessed March 10, 2016. 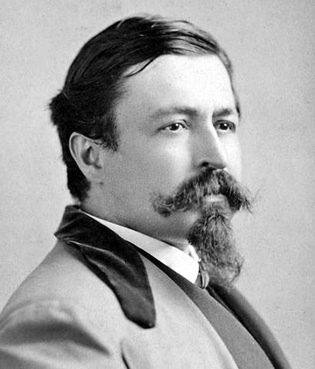 "Thomas Nast Biography." The Ohio State University Billy Ireland Cartoon Library and Museum. Last modified 2002. Accessed March 10, 2016.